The Lehigh Valley Zoo family now has two more adorable mouths to feed. After months of anticipation, the Zoo’s herd welcomed twin baby Toggenburg goats on May 11th—one male and one female. Weighing in at 3.8 and 3.9 kilograms, both little ones (kids) are healthy, happy, and growing quickly. Their mom, Dinah, is recovering well and demonstrates the typical characteristics of nurturing and hovering that are the hallmarks of new motherhood. The Toggenburg is the oldest known breed of dairy goat, known for its high milk production and the Zoo now houses a herd of 5 adults and 2 kids of both Toggenburg and Nubian breeds. The twins, along with mom, were introduced into the rest of the herd on Monday, May 16th and guests can get a peek at these loveable additions to the Zoo family by visiting the main yard at the goat barn. “Both kids enjoy spending time together, climbing on their mom and rocks, and sleeping in the sunlight. They’re very active and can often be seen exploring anything new in the yard,” shared Samantha Wegman, Lead Animal Keeper at the Zoo. Both babies are also available for our Adopt an Animal program, which is a great way to support the Zoo and learn more about your favorite animals. For more information about our Adopt an Animal program, visit our website at www.lvzoo.org. 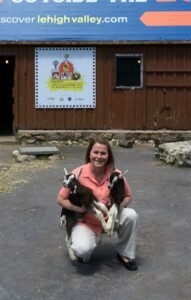 Lehigh Valley Zoo President, Melissa Borland, cuddles two newborn Toggenburg goat kids. Accredited by the Association of Zoos and Aquariums (AZA), the Lehigh Valley Zoo hosts yearround, family-friendly events and activities, educational programs, and camps. With a mission to create a safe, engaging and enlightening wildlife experience for guests of all ages, the Zoo demonstrates leadership in the cultural, scientific and conservation communities. To learn more about Lehigh Valley Zoo, we invite you to visit our website, www.lvzoo.org, or follow us on Facebook.